The wide discovery and acceptance of the existence of extremophiles of the last decade is opening the gate for a wider acceptance of the idea that life can travel through cosmos and can be found on other planets, in conditions we previously thought inhospitable and not conducive to life. A few years ago, perhaps less than a decade, a friend of mine invited me to Ontario Science Centre to watch a 3D documentary under the Dome. It was about an expedition to the bottom of the ocean where some organisms capable to live in conditions previously thought to be impossible. These organisms were called extremophiles, as they seem to like some very extreme conditions. One image that I found almost unbelievable was a plethora of bugs that came to feed on lava that was gushing out of a crevice. So drawn they were to the stream of nutrients that they seemed oblivious to the fact that their feet were being burned. After the show, as we left earlier, we had a chance encounter with one of the scientists who made the documentary and had a chance to ask a number of questions. That was to me an eye opener. I did not know that lava could be “nutritious” to some, I had always assumed that it was not only far too hot, but also highly toxic, as it contained numerous elements (Hg, Pb etc.) in unknown and often dangerous concentrations. Yet there were organisms clearly feasting on it. It seemed as if Gaia was taking care of and feeding its offspring. This was a paradigm shift in my beliefs, as I always assumed that there’s no way that either Jules Verne’s Journey to the Center of the Earth or Sir Arthur Conan Doyle’s Lost World had any chance of being true. I thus took a renewed interest in geology and the Gaia Hypothesis. In southern Romania near the shores of the Black Sea, researchers have stumbled upon one of the most bizarre and isolated ecological niches of the world. The cave of Movile harbours an ecosystem that exists completely independently of photosynthesis-the only such terrestrial ecosystem known. The 300-meter-long cave was discovered by Romanian scientists in 1986, and has no natural entrance. Scientists believe that the cave has been isolated from the photosynthetic world for approximately 5 million years, and the entire ecosystem is chemoautotropic in nature-instead of sunlight, the energy source for the ecosystem comes from microbes exploiting sulphur in the caves' water. To date, they've identified 48 different invertebrate species thriving in this subterranean environment, 33 of which have been found no where else in the world. Many of them are sightless anthropods-blind spiders, predatory leeches and water scorpions. These organisms have followed different evolutionary paths than their aboveground cousins; they've lost their pigmentation, grown extensive antennae, and dispensed with not just their vision, but also (in some cases) their eyes. Underground hot springs, rich in hydrogen sulphide, provide the energy and nutrient sources upon which this ecosystem thrives. The situation in Movile is remarkably similar to those found at several locations on the ocean floor, along the mid-oceanic ridges at depths of 2 kilometres or more. Researchers in small submersibles were shocked to discover thriving ecosystems clustered around deep-sea hydrothermal vents. The mineral- and sulphide-rich water is heated by the underlying magma and spews upwards through cracks in the ocean floor. Temperatures are in excess of 350°C. These columns of superheated water are black in colour and can extend to great heights, like underwater Old Faithfuls. The colour lends them their name: "black smokers". Inside and all around these columns live sulphide-eating bacteria that thrive at high temperatures. Like the bacteria in the Movile cave, these black-smoker bacteria form the base of a food chain entirely independent of photosynthesis. The 3-metre-long tube worms, along with the mussels and shrimp that thrive here, depend upon the chemosynthesis of these bacteria to exist. In many cases, the organisms rely upon a symbiotic relationship with the sulphide-munching bacteria found in the specialised organs that have replaced their digestive systems. Over 300 different organisms in these strange environments have been identified so far. Some scientists hypothesise that geothermal vents such as these may have been the initial incubators where life first developed. But that’s not all. A bacteria was resurrected after 120000 years of slumber in a Greenland glacier. The Herminiimonas glaciei bug is not the oldest to ever be resurrected, but it’s the first “ultramicrobacteria” to be revived. Ultramicrobacteria, tiny even by bacterial standards, are about 10 to 50 times smaller than the common human intestinal microbe E. coli. Their diminutive size could give the bacteria a survival advantage over other microorganisms. H. glaciei, for example, is thought to have survived in thin capillaries of nutrient-rich water in the Greenland glacier that would have been too tight a fit for larger bacteria (natgeo). 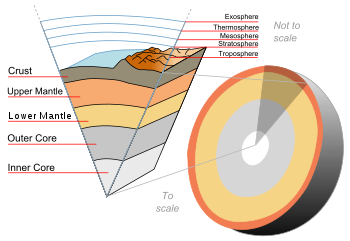 On a hypothetical journey to the centre of the Earth starting at the sea floor, you would travel through sediment, a layer of basalt, and then hit the gabbroic layer, which lies directly above the mantle. Drilling expeditions have reached this layer before, but as the basalt is difficult to pierce it happens rarely. The organisms living there in the deepest part of the crust were strikingly different that the populations in other rock layers, the team says in a study published in PLoS One. One key difference was that archaea were absent in the gabbroic layer. Also, genetic analysis revealed that unlike their upstairs neighbours, many of the gabbroic bugs had evolved to feed off hydrocarbons like methane and benzene. This is similar to the bacteria found in oil reservoirs and contaminated soil, which could mean that the bacteria migrated down from shallower regions rather than evolving inside the crust, the team says. Our results raise the intriguing possibility that hydrocarbons in very deep ocean rocks support microbial communities…. Our findings, particularly regarding the presence of genes coding for methane cycling, have implications not only for Earth’s subsurface, but also for other planets such as Mars. Methane on Mars is concentrated in some equatorial regions of the atmosphere, which suggests that it is derived from localized geological sources. Although the exact mechanism by which methane forms on Mars is not known, serpentinization reactions in the Martian subsurface have recently been proposed. Therefore, similar to the Atlantis Massif, the Martian subsurface may harbor methane-consuming prokaryotes. Now onto doomsday theories re: human extinction (because, as it should be obvious by now, life will most likely survive; it’s only us who might extinguish ourselves). This entry was posted on 23.3.11 and is filed under history , theories .